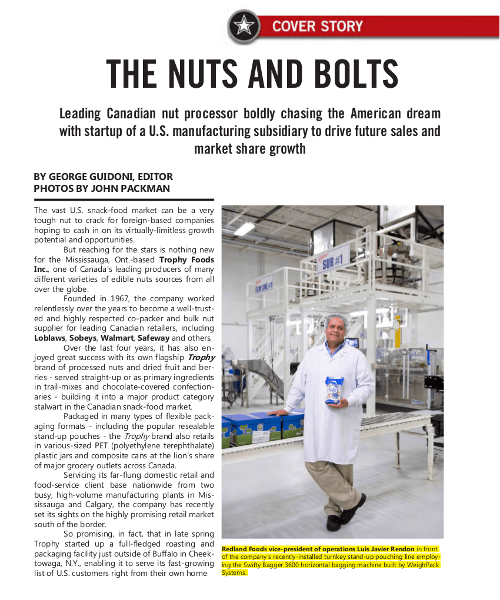 Leading Canadian nut processor boldly chasing the American dream with startup of a U.S. manufacturing subsidiary to drive future sales and market share growth.The vast U.S. snack-food market can be a very tough nut to crack for foreign-based companies hoping to cash in on its virtually-limitless growth potential and opportunities. But reaching for the stars is nothing new for the Mississauga, Ont.-based Trophy Foods Inc., one of Canada’s leading producers of many different varieties of edible nuts sources from all over the globe. Founded in 1967, the company worked relentlessly over the years to become a well-trusted and highly respected co-packer and bulk nut supplier for leading Canadian retailers, including Loblaws, Sobeys, Walmart, Safeway and others. Over the last four years, it has also enjoyed great success with its own flagship Trophy brand of processed nuts and dried fruit and berries – served straight-up or as primary ingredients in trail-mixes and chocolate-covered confectioneries building it into a major product category stalwart in the Canadian snack-food market.